Due to its size and geographic nature, Jupiter is comprised of many small neighborhoods, each with its own personality and character. 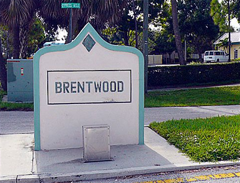 One very small, central Jupiter community is Brentwood South. Brentwood Homes Listings & Sold Statistics! The homes in Brentwood South are located just off Toney Penna Drive, a main corridor which winds its way through neighborhoods, schools and parks and connect the east and west sides of town. Brentwood South is also located next to the North County Aquatic Center which is home to the Jupiter Sea Dragons swim team. These single family homes are both three and four bedroom and most do not have private pools. But when you live next door to the County facility, why bother with the hassle of your own pool? They range in size from about 1,300 square feet to a little over 2,000 feet and were built in the late 1970’s and early 1980’s. The community is so small there is no gated entrance. But the best feature of Brentwood South is the location. In addition to the North County Aquatic Center, the Jupiter High School is less than ½ mile away. Other facilities within biking distance are the Town Hall, Jupiter Community Center (home to many civic events and educational activities), the County Library, the Post Office, the Jupiter Medical Center and many other medical support operations like Jupiter Open Imaging. Like everything in Jupiter, the beaches are just 5 minutes away (maybe 10 if you catch the Indiantown Road bridge in the up position) and here you will find miles of wide, clean and free beaches where you can bring the family dog. The Friends of Jupiter Beach have provided a “dog friendly” environment with your dog is always welcome. And the Jupiter Inlet, Dubois Park and Jupiter Beach Park are also less than a 10 minute drive away. Posted in Brentwood South on June 2, 2011 at 5:40 pm.